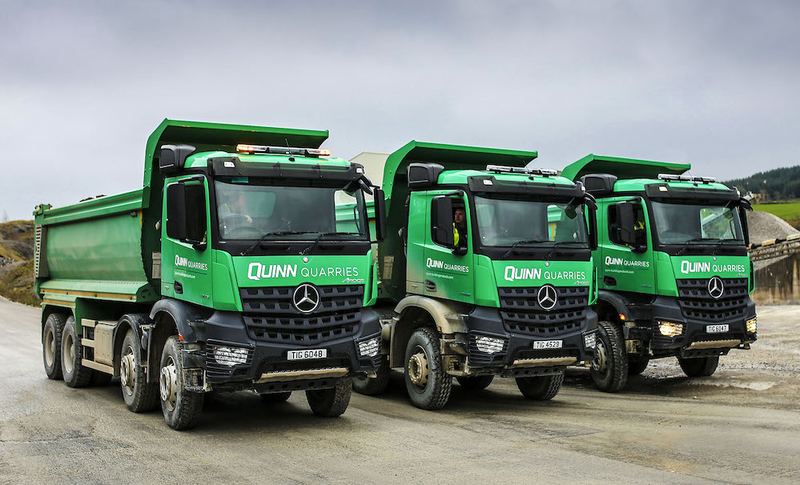 A County Fermanagh company, Quinn Building Products has taken delivery of 14 8×4 Mercedes-Benz Arocs tippers as part of the company’s ongoing fleet replenishment programme demonstrates a commitment to health and safety and the organisation’s ongoing drive to reduce their environmental impact in every area of their operations. The new mountain lorries have been uprated to 41 tonnes, through MBNI Truck and Van. They will be used to transport 33 tonnes of aggregate from the company’s quarries to its cement plant and join a 150-strong fleet. 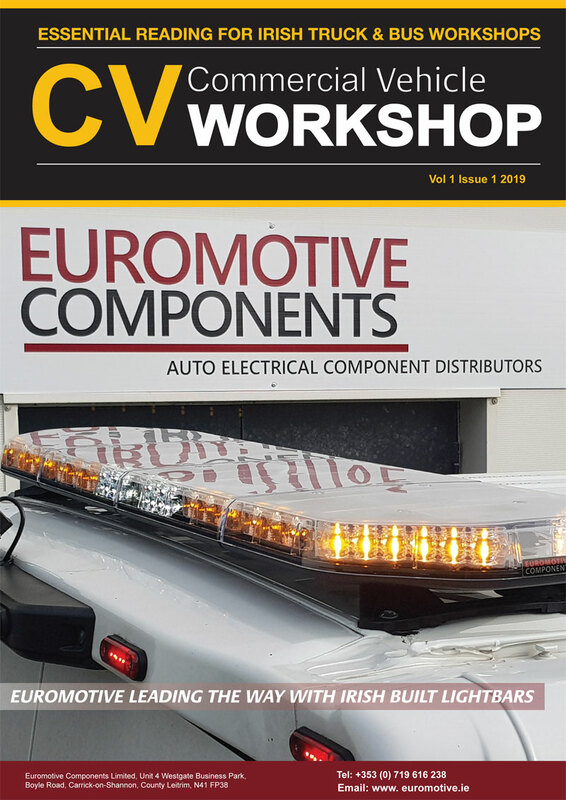 They were received by Quinn in 2018, were chosen for their quality and reliability, with Quinn opting for enhanced safety features to reduce wear and tear on brakes and drivelines. Quinn opted for the ClassicSpace cab and, due to the heavy-duty nature of its work, specified the larger 12.8-litre OM471 engine generating 476hp and 2,300Nm. The bodies were supplied by C-Tec of Magherafelt and Gleesons of Tipperary. The tippers are used to transport loads of aggregate from Quinn’s quarries to the Quinn Cement plant, which is described as “an extremely demanding task which demands vehicles built to the very highest standards,” by Transport Manager Brian McManus. The 14 tippers, which are purpose designed for construction related applications, were supplied to Quinn by MBNI Truck & Van. All are 8×4 Arocs 4148 models with 12.8-litre straight-six engines rated at 350 kW (476 hp), and ClassicSpace cabs. Each truck is capable of carrying a 33-tonne payload, which increases the capacity of the older models being replaced. Over the last year Quinn has also taken delivery of a number of other Mercedes Benz vehicles, including 24 Actros 2445 StreamSpace tractor units with small, 17.5-in wheels on the mid-lift axles, which save weight and free up useful space on the chassis. Powered by 330 kW (450 hp) engines, the Actros transport bagged and bulk cement powder, as well as a range of building products. Quinn has also recently commissioned a further three road-going 32-tonne Arocs 3240s – one has an insulated tar-specification tipping body, the other two with mixer drums for concrete deliveries. Quinn’s multi-million pound Fleet Replenishment Programme will continue until the end of next year, when the company expect to have upgraded all of their trucks and ageing plant machinery, ensuring the highest standards of safety, greater efficiency and reduced environmental impact.